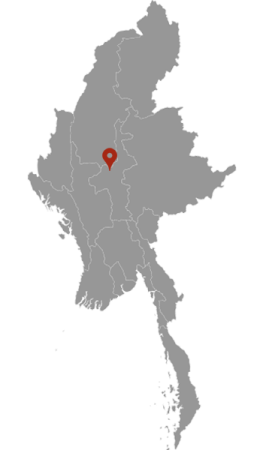 Inwa or Ava, located in Mandalay Region, Burma (Myanmar), is an ancient imperial capital of successive Burmese kingdoms from the 14th to 19th centuries. Throughout history, it was sacked and rebuilt numerous times. The capital city was finally abandoned after it was completely destroyed by a series of major earthquakes in March 1839. Though only a few traces of its former grandeur remain today, the former capital is a popular day-trip tourist destination from Mandalay. Experience an organized, full-day tour to Ava, Sagaing, Amarapura and famous Mingun villages by private car. Explore the lifestyle of the rural communities in Upper Myanmar (Burma) and their historical monuments. Full day Excursion trip to three ancient cities of Ava, Sagaing, and Amarapura in and around Mandalay. This tour includes hotel pickup, air-con car, Tour guide service and boat & horse cart fees at Ava.